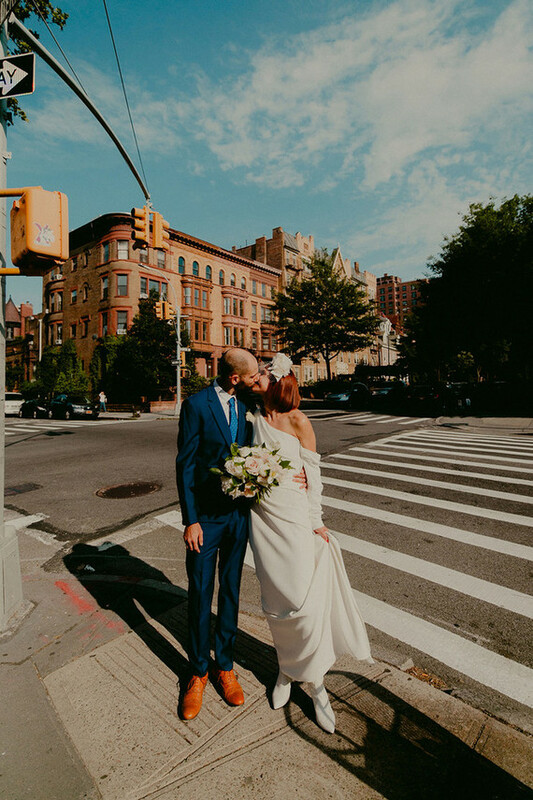 If we had to sum up Anna + John’s Brooklyn brownstone wedding in one word, we’d have to say thoughtful. Yes, they’re totally stylish and oh so cute, but every detail that went into their Maison May celebration was completely unique to them and their 75 guests?right down to their sweet favors, a copy of Pablo Neruda’s Love Poems for each friend. It doesn?t hurt that Anna is a super talented designer (see all their graphic elements on her site here! ), so each eclectic element came together just right. Thanks to Chellise Michael Photography for sending these whimsical wedding photos our way! PS: Don’t forget to read their sweet proposal story at the end! Our bride, looking incredible in Vera Wang with a Rachel Trevor Morgan hairpiece. Really digging these quirky portraits Chellise Michael Photography captured at their stylish venue. Kind of Wes Anderson-esque, no"
Anna tells it, Since John and I are coming from different cultures and continents (literally), we decided to make our own rules. We wanted to gather our close and diverse group of family and friends from all over, and just simply celebrate our love. We wanted to get married in Brooklyn, the place where we met and the place we call our home.